This is a journey that spans thousands of miles, three countries and several generations — tracking real monarch butterflies that leave Canada for their mysterious winter haven high in the mountains of Mexico. Based on true events, Flight of the Butterflies 3D follows the extraordinary migration of the monarch butterfly and the determined scientist, Dr. Fred Urquhart of Toronto, who spent 40 years to unearth where they went each fall. Discover a truly spectacular sight: hundreds of millions of butterflies in the hidden butterfly sanctuaries high in the mountains of the States of Michoacán and Mexico. As a special benefit for SMBAS fans, enjoy a special IMAX discount: Save $1 off Child and $2 off Adult IMAX admission. Click HERE for this discount. 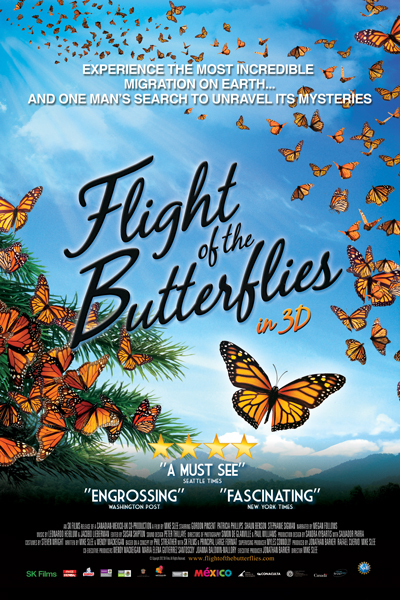 Flight of the Butterflies 3D is running until April 3, 2014 in the IMAX Theater at the California Science Center next to the Natural History Museum of Los Angeles County in Exposition Park. More info, including show times, on Flight of the Butterflies 3D.